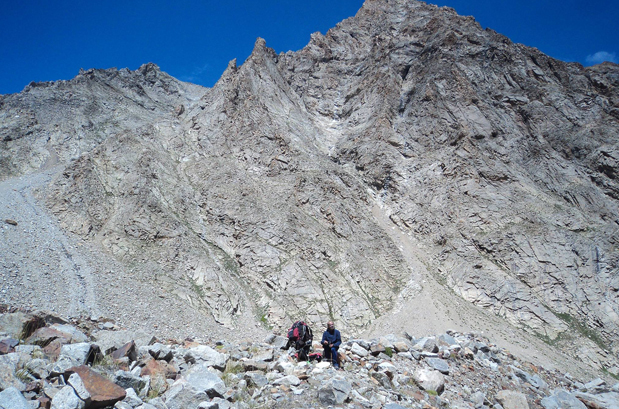 One of the most challenging treks in the Indian Himalayan region, the Kinner Kailash Parikrama trek takes you into a deep wilderness of the Kinnaur region in Himachal Pradesh. The most scenic and remotest regions of Himachal, located close to the Indo-Tibetan border, Kinnaur is home to the sacred Mt. Kinner Kailash. The Sutlej River rising from the slopes of Kailash Parvat near Mansarovar Lake in Tibet, flows through the Kinnaur valley adding to its serene and picturesque charm. 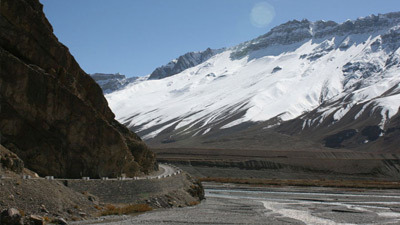 Owing to the valley's close proximity to Tibet, you will find a unique blend of Hinduism and Buddhism cultures; the pagoda style architecture and monasteries are quite common in the area. Needless to say, being a sensitive border area, foreign nationals are required to take prior permits from tourism authorities. Considered to be one of the mythical abodes of Lord Shiva, Kinnaur holds a great religious significance for devotees of Lord Shiva as Mt. Kinner Kailash in the region boasts of housing a 79 ft. tall Shivlinga that changes its colour which each passing moment. 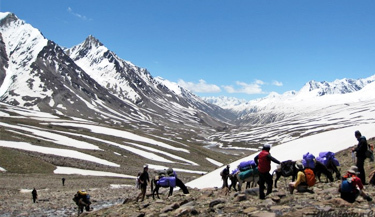 Mostly attempted by pilgrims, the Kinner Kailash Parikrama (circumbulation) trek is a test of one's faith, physical and mental fitness and strong determination. 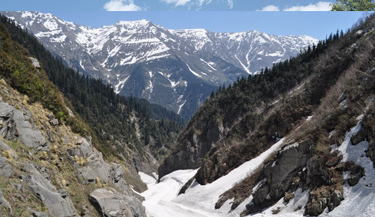 Along the trek, while revelling yourselves in unmatched scenic vistas of beautiful meadows, apple orchards, hanging glaciers and towering peaks, also be prepared to negotiate your ways through treacherous trails, climbing massive boulders, ascending narrow paths with loose gravel and stones and crossing large water streams. Opportunity to visit Rangrik and Charang monasteries at Charang village and Ki and Tabo monasteries at Spiti valley. 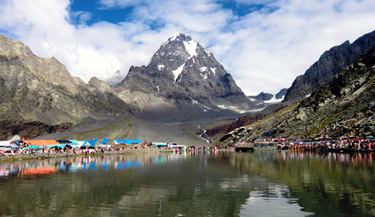 Chance to revel in the 360 degree panorama of Kinner Kailash range. 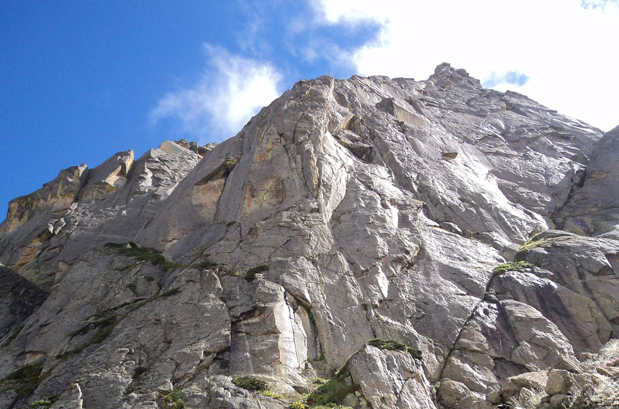 The Kinner Kailash sits amidst the captivating Kinnaur Valley in Himachal Pradesh. Considered to be the land of dreams and fantasies, a trek to this fairyland is an unforgettable experience. The Kinner Kailash Parikrama or circumblation around the Mt. Kinner Kailash region is considered to be religiously significant for many Hindus. 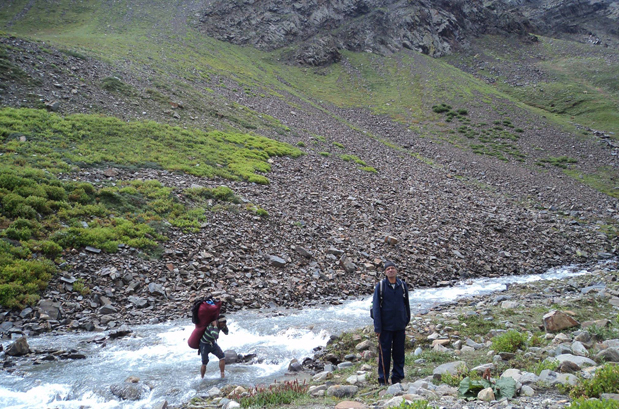 Owing to the same reason, many pilgrims and devotees venture on this trek every year. How to Reach Kinner Kailash Parikrama Trek? Chail, near Shimla in Himachal Pradesh is the main starting point for the Kinner Kailash Parikrama trek. Following modes of transport can be used to reach the location. By Road: Volvo, Himachal state run buses, Delhi tourism buses and taxis can be directly hired from Delhi and Chandigarh up till Shimla or even directly to Chail. Further, cab can be availed to reach Thangi. In the evening you will travel to Shimla by Luxury Volvo bus. Overnight journey. On the day two, the trip begins with a drive through Narkanda, Kufri, and Shri Bhima Kali Temple in Sarahan Bhushar, Rampur Bhushar, then we will proceed to Jeori (which has hot water sulphur stream and offers stunning views of the valley). We will travel mainly on the metalled roads and pass through the thick woodland to reach Kalpa. During this time of year the Apples has a subtle fragrance that is tantalizing. Some of the finest chilgoza and apple orchards are found here. Here, one can enjoy an awe-inspiring picturesque view of the 6050 metres towering Kinnar Kailash range. We will stay overnight in Kalpa in a hotel for some rest and dinner. On day three we will drive from Kalpa towards Lambar in the morning, a startlingly stunning destination, situated high on top of an abysmal gorge, with the quaint village nestled atop. We will then come back at the campsite, rest for the entire day at leisure for the acclimatization and stay here for overnight. We will commence our trek to the Kinner Kailash Parikrama, in the morning post breakfast from Lambar to Shurting towards the northern east direction climbing the height and following the stream. It is a parallel stroll. Surting is a little high land, here two river watercourses meets together forming the Lambar River. An ultra-modern advanced ITBP post located at 3150 meters where your names will be entered with regard to movement of the trekkers. Bonfire and overnight stay in the camp set up in Shurting. This is a parallel hike of about three to four hours. Charang is well-known for its 11th century monastery known as the Rangrik Tungma Complex. After reaching the destination you can explore the spectacular surroundings and indulge in some relaxation and acclimatization. We will stay overnight in the camp located near to a gorge in Charang village. On this day early in the morning we will begin an uphill trek in the Charang valley, covering about eight kilometres in approximately six to seven hours. Lalanti has gorgeous pastures with stunningly amazing high altitude flowers. It is an extensive carpet of blossoming red and yellow flowers under the expanse of blue sky with the sound of garrulous Mountain Rivers that adds up further magnetism to the charming exquisiteness of the valley and the overall experience of trekking. The Camp site is situated adjacent to a stream in Lalanti. Here, you will need to ascend moderate incline and from here we will camp below the Lalanti Pass. On this day you can spend the entire day enjoying the spectacular and picturesque sights around the Chitkul village. Chitkul is located at an altitude of 3500 metres. It is the uppermost and the last village of the Sangla Valley. Ahead of Chitkul is there is the complicated and astonishing mountain territory and further moving ahead is Tibet. In fact, Chitkul is located in the region that was earlier used as the route for trade and commerce between Tibet and India. One can simply see the Tibetan influence in the jewellery they wear and as well as in the looks of the people. Chitkul is packed with distinctive and spectacular sights. Trekkers will come across cutting and twisting streams, gorgeous countryside, thickly forested hillside, extensive alpine meadows and last but not the least, deserted mountains. In Chitkul, there are three Goddess Mathi's temples. The earlier temples situated here are believed to be built about five hundred years ago. On this day we will leave Chitkul in the morning and drive back to Chandigarh passing through (Sangla, Narkanda, Rampur Bhushar, and Shimla). From Shimla take AC Volvo coach for Delhi at 22:00 hrs. Overnight journey. When to book Kinner Kailash Parikrama Trek? You should book Kinner Kailash Trek two months in advance so that you get ample amount of time to prepare well for the trek. Our pick up and drop point for Kugti Pass trek is Delhi/Pathankot train station. At Pathankot our guide will pick you from train station and then from there your tour will start. What is minimum age required for Kinner Kailash Parikrama Trek? Kinner Kailash Trek is tough trek with a maximum altitude of 17200ft (5242m) minimum age required is 15 years. What will be the minimum temperature during Kinner Kailash Parikrama Trek? 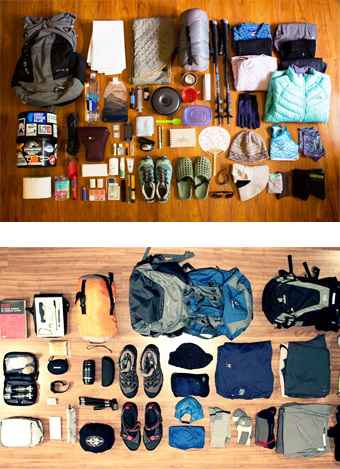 How long we trek during Kinner Kailash Parikrama Trek? We plan our treks in such a way that after 6 hours of trekking we reach next camp around lunch time and normally trek a distance of 10-15 Kms.